Nick Muce is the Head Chef and GM at Fox Hopyard’s On The Rocks restaurant. Nick has over 30 years of cooking experience, getting his start in his family’s Italian restaurant when he was only 13. He is classically trained and has worked all over the country, regionally at the former Avon Old Farms Inn, and was an executive chef at Water’s Edge Resort & Spa in Westbrook for over a decade. He has been with Fox Hopyard for two years. Nick describes his cuisine style as “global” and believes in local product, sourcing locally when possible and holding farm-to-table events at the restaurant. 1. Slightly heat sauce pan and add pancetta. Cook until just starting to brown. 2. Add garlic and sauté until just toasted. 3. Add cream and bring to simmer. 4. Add cauliflower and simmer until just tender. 5. Add Parmesan cheese and stir until completely incorporated. 6. Place mixture in a blender, drizzling in truffle oil until smooth. Season with salt and pepper to taste. 1. Heat canola oil in non-stick sauté pan until oil is very hot. 2. 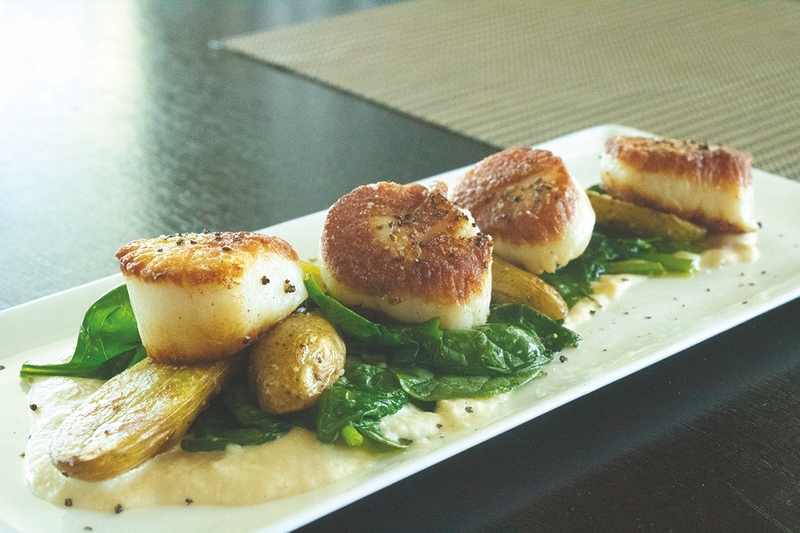 Season and sear the scallops for approximately 3-4 minutes or until golden brown. 3. Turn over scallops and sear for additional 3 minutes. Scallops will be a “medium” temperature in the center, opaque color. 4. Cook less for rarer and more for well done. 1. Smear puree down center of plate. 2. Top with sautéed spinach or vegetable of your choice. 3. Place scallops on top.